Posted by Dissent at 5:39 pm	Business Sector, Exposure, Non-U.S. 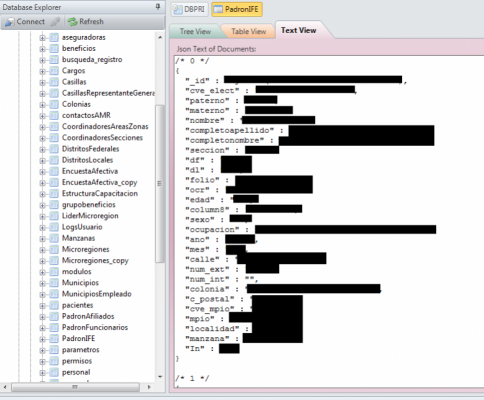 This is just a quick note to explain that I discovered another publicly exposed Mexican database on Wednesday, May 20th. I reported it to the Mexican electoral authority (INE) that same day. As far as I know, they did not mention the political party responsible for this leak. 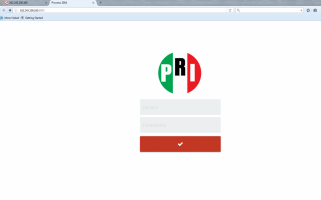 I can report that the database was titled “DBPRI” and all signs point to the PRI party as being responsible here. 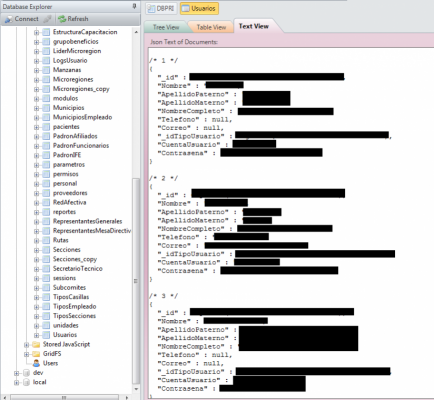 As with the first misconfigured database, this one also exposes a lot of personal information on voters, and appears to contain information on 2,072,585 citizens. INE’s statement can be found here (ES). They indicate that the database was hosted on Digital Ocean, so again we seem to have a database with Mexican voters’ personal information being hosted outside of their country. PRI (Partido Revolucionario Institucional) does not seem to have issued any statement, and while Chris may well be right in his hypothesis that they are the owners of misconfigured database, it would be wise for us all to wait for confirmation from INE or the political party.